Displaying photos is a great way to surround yourself, or your loved one, with fabulous memories. With some typical household products, you’ll put this photo frame on display in no time. With simple instructions from iParty.com, you can easily create this with your child to give to a relative as a gift or to put up in their very own room. 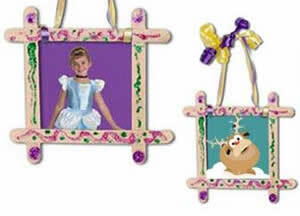 Lay photo on table and arrange wooden craft sticks around the photo, so that the corners overlap. Using a glue stick, apply glue to the bottom two sticks near the top and near the bottom, at the same location on both sticks. Press each of the other two sticks onto the two glued areas, creating a square. Tie Ribbon to the top corners of your frame for hanging. Measure your photo frame’s height and width from the outside of your frame. Cut your photo to the size you have just measured. Glue the backside of your frame’s right and left edge and press the front side of your photo to the frame. Using glitter glue pens, add some sparkle to your frame. You may want to use other items to decorate your frame such as small stickers or glue on some confetti for extra pizazz!